Since the global and European crises, processes of welfare retrenchment in the field of education, which include marketization in search of ‘employability’ in knowledge-based capitalist strategies, have heightened. This intensification, we argue, has been meet by more openly disruptive subjectivities developed on the part of students and education workers, who themselves had already prior to the crisis become both increasingly precarious and militant. Here we sketch the historical development of education in the context of European integration, developing a reading of education as a field of conflict, in which we position the social movements that form the focus of our research, especially highlighting the development of students’ movements in both the UK and Spain during the global and European crises. European integration has created two key sources of pressure upon public education. First, the general pro-retrenchment effect of European integration has resulted in declining public funds being allocated to education provision. Second, European integration (and especially the Bologna Process) has been used as a process through which to advance the marketization of public education (and especially university-level education), as part of a broader skills-based accumulation strategy. These pressures, however, have also faced considerable and obstructive opposition, especially from students and faculty within the national education systems. As we shall see in this section, however, the so-called ‘age of austerity’ that followed the onset of crisis in 2008 has provided an opportunity for governments and education ministries across the European Union to seek to impose further marketisation still. Indeed, the public sector debt crisis was used in multiple instances across the European Union as a means by which to advocate the further subordination of higher education to the demands of the market. As Holborow argues, employers and the state used ‘the recession to implement a double-pronged strategy: to tie higher education more closely to the needs of capital and, also to entrench neoliberal ideology in what is taught and thought and in the way higher education work is done’ (Holborow, 2012). The post-2008 context has seen a combination of continued commitment to market competition, centralised management of universities, and a managerialist process of quality control. This was clearly reflected in the sentiments expressed in the 2009 Communiqué of the Conference of European Ministers Responsible for Higher Education. It was the context of heightened market competition for the provision of higher education – something which had been (somewhat unevenly, as we have seen) promoted across Europe as a result of the Bologna Process – that has been consistently heralded as one of the key factors necessitating the cost- and efficiency-focused reforms that are being sought. That is, having created heightened market competition through Bologna, EU states are now citing that market pressure as the reason why universities must be made more competitive into the future. This agenda was starkly evident, for instance, with the introduction in 2009 of the ‘impact’ agenda for evaluating research in British universities, which introduced a strong focus on ensuring that research aims at ‘fostering global economic performance, and specifically the economic competitiveness of the United Kingdom’. The consequences of the European crisis – both regarding further austerity and marketization processes – in turn led to a rising discontent within educational communities. Whilst staff saw their working conditions deteriorate and increasingly faced unemployment or precarious conditions, pupils and students as well as parents became increasingly worried about the quality of education and future job prospects. Further, contradictions were perceived between top-down, retrospective measures to increase quality and innovations imposed by the governments (such as surveys and indicator-based rankings), and austerity programmes that at the same time undermined efforts to achieve quality, leading to an increased interest in political processes among pupils and a politicisation of educational institutions. It is within this context that we see the development of a series of education-focused anti-austerity movements. Indeed, protests and movements for public education emerged throughout Europe and played an important part in anti-austerity coalitions, as our subsequent case studies on the UK and Spain below will highlight. Within these struggles, we argue, we see both the defence of public education and also the emergence of fragile (utopian) horizons that point towards education as a common (Terranova, 2015). One of the earliest eruptions of contestation over higher education in the UK during the post-2008 context was that witnessed in opposition to the proposed closure of Middlesex University’s philosophy department. On hearing of the University’s plans for closure of the department, in April 2010, students engaged in an occupation of the department building. This was, as far as we know, the first use of the occupation method by students in direct response to proposals for austerity during the post-2008 period. The Middlesex dispute created considerable attention amongst the student movement, and eventually lead to the wholescale move of the permanent faculty to Kingston University, a move which represented a partial victory for those campaigning. These events were only the forerunner, however, for what was to come in November 2010, as part of the NUS protest event in opposition to the government announcement that had been made the previous month, that the cap on undergraduate tuition fees would be tripled (from £3000 to £9000) as part of reforms intended to increase funding for the higher education sector and reduce the costs paid for out of the public purse. The demonstration, which was due to take place on 10 November 2010, was planned as a ‘standard’ demonstration and march through central London, which would include a walk past parliament. However, the title given to the demonstration by the NUS, ‘Demo-lition’, appeared to have been prescient when what appeared to have been a coordinated detour by the march witnessed protesting students and school children breaking the windows of the Conservative Party Headquarters building, Millbank, and eventually witnessing thousands of protesters gathering outside, with hundreds entering the building, breaking onto the roof of the building, and waving flags of assorted revolutionary brands from the rooftop. The scenes were striking – broadcast through both traditional media and social media – including anarchist flags (amongst others) being waved from the roof of the building, students occupying the building, and a large group of protesters gathering outside the building. These acts of disruption sparked a massive wave of dissent amongst the student community (and oftentimes, as we have seen, spilled over into additional and overlapping cycles of struggle within the broader anti-austerity movement). This event marked the beginning of the biggest wave of student mobilisation in over three decades, forming a major part of the anti-austerity movement witnessed in the UK, including roughly one-third of all protest events reported during 2010 (Bailey 2014). Thus, almost immediately after the 10 November demonstration and Millbank protest, students at the University of Manchester staged one of the first occupations of university buildings in an attempt to register dissent at the proposed tuition fee rises. By the end of the month similar occupations had occurred at SOAS, Manchester Metropolitan University, University College London, University of Birmingham, University of Oxford, University of Cambridge, University of Bristol, University of Plymouth, the Warwick Arts Centre at the University of Warwick, the University of Leeds, University of Edinburgh, University of Brighton, Cardiff University, Queens University Belfast, and Nottingham Trent University. Students also staged occupations in, or demonstrations outside of, a number of Liberal Democrat MPs constituency offices. This included an occupation of the office of John Hemming in Birmingham, Jenny Willott in Cardiff, and Simon Hughes (Bermondsey and Old Southwark). It also included a series of subsequent demonstrations that sought to further galvanize the protest momentum that had been witnessed in Millbank, through subsequent demonstrations in Central London, on 24 November 2010, 30 November, and 9 December, each of which witnessed clashes with the police following their inability to contain the student protesters within pre-defined marching routes. The media images associated with each of these events also added further momentum to the student movement, creating a growing sense of escalating public and student opposition to the tuition fees regime. The main concession that the Liberal Democrats achieved was the agreement that the £21000 repayment threshold (below which graduates would not begin repaying their loan) would raise annually in line with inflation. A secondary concession was the requirement that universities charging over £6000 in annual fees were required to negotiate an ‘access agreement’ with OFFA (Office for Fair Access), which would show how some of the revenue from the tuition fees would be used to widen participation, for instance by increasing support for students from lower income backgrounds. These access measures were estimated to cost between 20-30% of the tuition fee revenue that comes from fees over £6000 (McGettigan 2013). In addition, it was agreed that any unpaid loans that remain unpaid after 30 years had elapsed would be written off. The complexity of the funding scheme adopted was such that it proved difficult for the government to calculate the extent to which loans would be repaid, as this depends on inflation and the wages secured by graduates. As a result, the savings achieved by the reforms were thought to be as little as five percent of the total support that was previously spent by the government per student (Crawford et al., 2014). In addition to the consequences associated with implementation, the Liberal Democrats also suffered a massive loss of electoral support. One of the immediate consequences was the continuation of student occupations across the country as a mark of opposition to the marketization of higher education in the United Kingdom. One of the most high profile examples of this was the creation of what came to be called the ‘Free Hetherington’ between February and August 2011. NCAFC (National Campaign Against Fees and Cuts) played an important role in the organisation of a number of the protests staged throughout this cycle of dissent. This emerged as an organisation challenging the leadership role played by the NUS within the anti-fees campaign, taking a much more strident position in opposition to tuition fees, promoting direct action forms of protest, as well as being critical of the internal democracy of the NUS. Indeed, from the outset NCAFC had focused its attention on campaigning student organisations rather than on student unions. NCAFC saw the combination of the creation of a formal organisation with a strategy that was largely based around prefigurative principles of direct action protest and horizontalist decision-making. In this sense, NCAFC represented an attempt to gain a more effective voice and in seeking to challenge the resource implications of the tuition fee hike, NCAFC members would be simultaneously committed to direct action, horizontal and fluid decision-making structures, the formal decision-making structures of the NCAFC organisation, and seek election within the established institutions of the NUS (of which they were highly critical). The student movement in the UK represented one of the most vibrant and ongoing instances of popular opposition to the austerity measures associated with the post-2008 period. Whilst focusing on the anti-tuition fee campaign initially, many members of the student movement would subsequently become key players in a number of the other anti-austerity campaigns witnessed throughout the post-2008 period, and in turn many became active contributors to the campaign to elect Jeremy Corbyn as leader of the Labour Party (Bassett 2016). Spanish education during the European crisis has exemplified a number of general trends throughout the EU, characterised by a particularly strident austerity-driven process of marketization, but also new and innovative social movements that arose in response. In the following sections, we trace the implementation and effects of this austerity-driven marketization in Spain. We then go on to show how the changes during the crisis caused increasingly precarious living conditions for both students and staff, but also lead to a politicisation and unification of parts of the educational community, which in turn paved the way for a development of horizontal social movements such as marea verde movements in different regions. In addition, these movements, as we show, drew on the radical-democratic repertoire of action that emerged within the 15-M movement. The austerity measures imposed in Spain, in part as a result of the conditions placed on financial support by the troika, had significant effects of the educational system. State funding of both regions and the central state were slashed. Neoliberal marketization was strengthened and democratic mechanisms within educational institutions were removed. The Government also introduce legislation to institutionalise worse conditions within the education sphere. For instance, the law, RDL 14/2012, raised the number of pupils per class and the number of lessons taught per teacher, while extending the waiting period before substitute teachers were hired. Universities also increased the amount of lessons taught per person, with negative effects for the quality of teaching and research. Public investments in R&D dropped sharply. As a result, the majority of universities faced financial deficits and a lack of staff. Support mechanisms for pupils and students, such as scholarships, but also payments for learning material, meals and transport, were all reduced. Competition between educational institutions increased as the Ley Orgánica 8/2013 para la Mejora de la Calidad Educativa (LOMCE) introduced new, centralised exams and evaluation mechanisms; and increased the possibility of selection for school places and performance-related funding. Democratic mechanisms were also dismantled within the education system, while the role of directors was strengthened. Subventions to private educational institutions (mainly Catholic) were cut to a lesser degree or exempted from cuts, thereby deepening tendencies of creeping privatisation. University tuition fees also soared in an attempt to compensate for the reduction in public funding. High youth unemployment rates also boosted demand for higher education, as education was seen as a possible means of bridging the crisis period, as well as a necessity in order to increase individual employability. Education places were however unable to meet this increase in demand, resulting in professional training courses increasingly rejecting applicants. Due to high rates of youth unemployment and increasing rates of precarious employment, education nevertheless became less and less able to serve as a means to guarantee a certain degree of social security. Spanish university graduates faced a higher risk of poverty than those in other European countries. As a result, young Spaniards found themselves under pressure to emigrate. 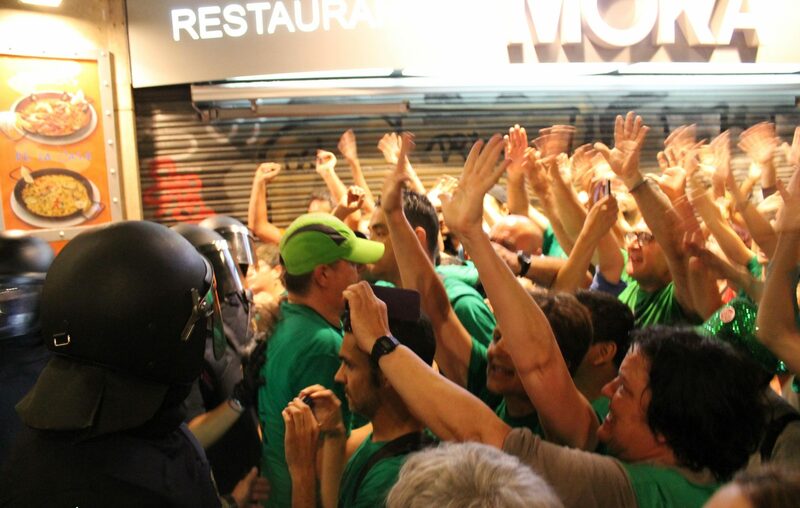 As we have seen, the 15-M was one of the major anti-austerity protest movements in Spain. Of relevance here, though, was that the broad majority of the participants of 15-M had a higher education background, and many had become politicised as a result of the anti-Bologna campaigns. In this sense, then, we might consider 15-M to be a movement with clear links to education, often reflecting the dissatisfaction of graduates and students whose expectations had been radically altered as a result of the crisis. 15-M subsequently fed into a wave of social movements that emerged within the Spanish school system in a number of Spanish regions. These drew on the repertoire of action and political climate created by 15-M. The movements were also often subsumed under the label, marea verde, a name derived from green shirts, with the demand for public schools for everyone, which became a symbol of the protest. The first eruption of the marea verde movement came in 2011 in Madrid, following cuts executed by the regional PP government prior to the RDL 14/2012 (including increases in the number of hours taught and the dismissal of nearly 3000 substitute teachers). Reacting to these cuts, the major trade unions of the sector organised city-wide assemblies that, in the climate of radical democracy established by 15-M, triggered a process of workplace organising at the margins of trade unions. Newly established assemblies soon took place on a regular basis in a large number of schools, witnessing the active participation of education sector employees – especially the teaching staff, and a notable, although less intense participation of pupils and parents. Despite (and, in part, because of) the participatory and grassroots’ nature of the assemblies, there existed a certain degree of unease in their relationship with the major trade unions. In some cases, the trade unions actively sought to slow down the campaigns and planned actions of the assemblies. This included a plan to stage unlimited strike action three days a week in Madrid, which CCOO, UGT and STEM each significantly watered down, seeking to ensure that the number of strike days would be finite, and also seeking to combine strike days with ‘action days’ in order to maintain cooperation with the more conservative trade unions, ANPE and C-SIF (Huke and Tietje, 2014). This, however, resulted in tensions between the new structures of the marea verde and the traditional forms of trade unionism, and which eventually and by the end of 2011 the protests in Madrid and participation in assemblies had gone into decline. In the following years, however, in part as a response to the experience of cuts and restructuring, the education movement spread to other regions in Spain. On 22 May 2012, a nationwide general strike in the sector of education took place that for the first time counted on the support not only of all relevant unions in the sector, but also of students’ and parents’ associations. Indeed, central to the strength of this mobilisation was the high number of pupils and students that participated (Huke and Tietje 2014). An additional episode in the development of Spanish education movements was witnessed during the school year 2013-14. This saw the teachers of the Baleares go on strike for three weeks in protest at both spending cuts and the adoption by the regional PP government of a decree committed to the ‘integrated treatment of languages’ (TIL). The TIL stated that lessons should be taught in equal share in Catalan, Spanish and English. Prior to this, lessons had been mainly (80%) taught in Catalan. As in Madrid, grassroots assemblies and the horizontal use of social media and mailing lists each played a key part in the mobilisations (Riutort Serra, 2014). Even the strike itself was led by what was referred to as the assemblea de docents, which coordinated the different assemblies and was supported (but not run) by the trade unions. Further actions included civil disobedience against the TIL, which successfully slowed down its implementation. The government reacted, however, by taking a number of those responsible for the boycott to court, although this sparked a new wave of protest (Huke and Tietje, 2014). In addition, in part as a result of the opposition it had experienced as a result of adopting the TIL, the PP regional government heavily lost the 2015 election, witnessing it being replaced in office by the social democratic PSOE and the left regionalist Platforms Més per Mallorca and Més per Menorca (and with the support of Podemos and Gent per Formentera). Once in office, moreover, this new government withdrew the TIL, which itself had anyway already been suspended by the regional High Court (Huke, 2016). In 2015, a reform was proposed, to reduce the length of bachelor’s degrees to three years and to increase the duration of masters degrees to two years in order to achieve a convergence with the university systems of the majority of European countries. This reform – popularly known as ‘3+2 Decree’ or ‘Wert Decree’ in reference to the Education Minister José Ignacio Wert – generated high levels of discontent among university students and student groups, since they considered it a covered way of increasing the price of tuition (as postgraduate tuition is more expensive per credit) and thereby increasing the elitism of higher education. The reform was made in a broader context of increasing precarisation and marketization of the Spanish university system, alongside reforms which had removed opportunities for internal democracy within the universities. The actions developed after the announcement of the Royal Decree 43/2015 were a mixture of forms of protest used traditionally by the student movement and more prefigurative radical practices. The first event organised by some Left student unions and trade unions, with the support of student assemblies, was a combination of a general student strike and marches in multiple Spanish cities against the ‘3+2 Decree’ and the LOMCE, which involved not only university students and personnel but also school students, teachers and parents. Other student strikes and marches were organised throughout 2015 and 2016, and were combined with direct actions, including the occupation of university buildings, the establishment of picket lines and the blockage of highways and public transports near universities. On the one hand, in March 2015, the Platform for the 3+2 Referendum created by the student movement in the Community of Madrid organised a referendum in the public universities of this Autonomous Community to canvas opinion of university students about the implementation of the reform. According to the organisers, more than 31,000 students voted in the referendum, 97.5% voted against the reform. This self-organised referendum was also subsequently replicated in other Spanish public universities with similar results and with turnout levels that surpassed those of the majority of official Rector Elections. Each of these initiatives resulted in the postponement of the ‘3+2 Decree’, following the agreement of the Conferencia de Rectores de las Universidades Españolas [CRUE, Conference of Rectors of Spanish Universities] agreed to postpone its implementation at least until 2017, when they expect to open a process of negotiation with the Spanish government. European integration, we have argued in this chapter, has affected education throughout the EU, as a result of both the decreasing fiscal capacity of the state associated with the process of European integration, but also as a result of the active promotion through European integration, of the marketization of education, and especially higher education (through the Bologna Process). As we have sought to show, however, these processes have been continuously disrupted, impeded and slowed down as a result of social movements developing within the education system. The processes of ‘pragmatic prefiguration’ (Bailey et al., 2016) have emerged as a response to these trends. Within these processes of organising from below, therefore, a new ‘presentist’ democracy has developed that is opposed to established forms of representative democracy, itself increasingly perceived as dysfunctional. This ‘presentist democracy’, Lorey argues, ‘is the opposite of representative democracy’. Instead, it is a ‘new form of democracy that is practised in the moment of the assembly in actively becoming presentist is not a non-political form of living’ (Lorey, 2011).